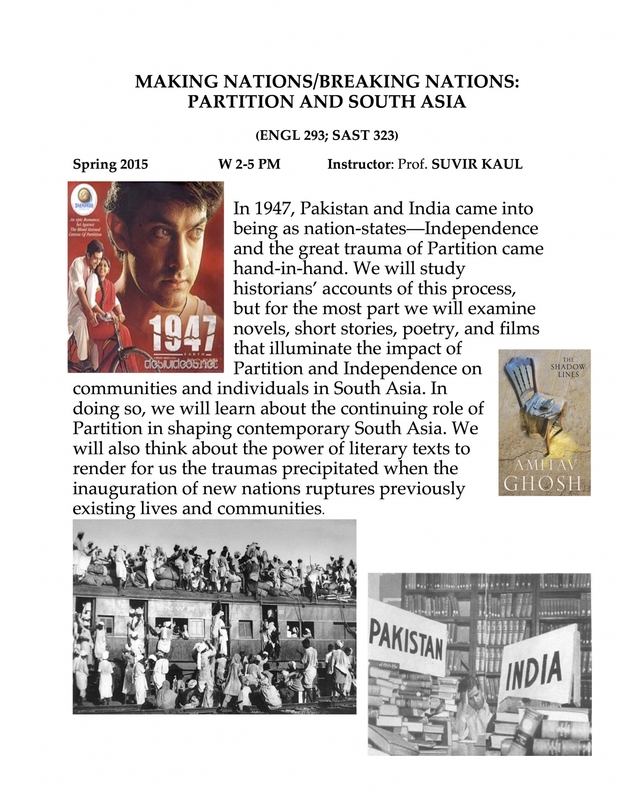 This course will examine literature and films that have addressed the difficult socio-political issues leading up to, and following from, the independence and partition of British India. Pakistan and India came into being as nation-states in moments of great national trauma: historians have long argued over the process that led up to Partition, and we will study some of these debates, but for the most part we will examine novels, short stories, poetry, and some films to think about the impact of Partition and Independence on communities and individuals in South Asia. In doing so, we will recognize the continuing role played by these events and experiences in shaping the cultural, social, and political realities of contemporary South Asia. We will also learn about the crucial role played by literary and creative texts in making available to us the full dimensions of human tragedy, especially those precipitated when the imperatives of nation-formation redefine the lives of individuals or of sub-national communities.